Do you ever have those days where you feel constantly parched no matter how much water you drink? Where your mouth is practically like the Sahara desert ALL. DAY. LONG? Well, that might be A BIT of an exaggeration…. but it’s definitely been one of those weeks where we live. Whenever the temperature rises, so does my craving for juicy and hydrating foods. One of my all time favourite hydrating foods is….you guessed it! 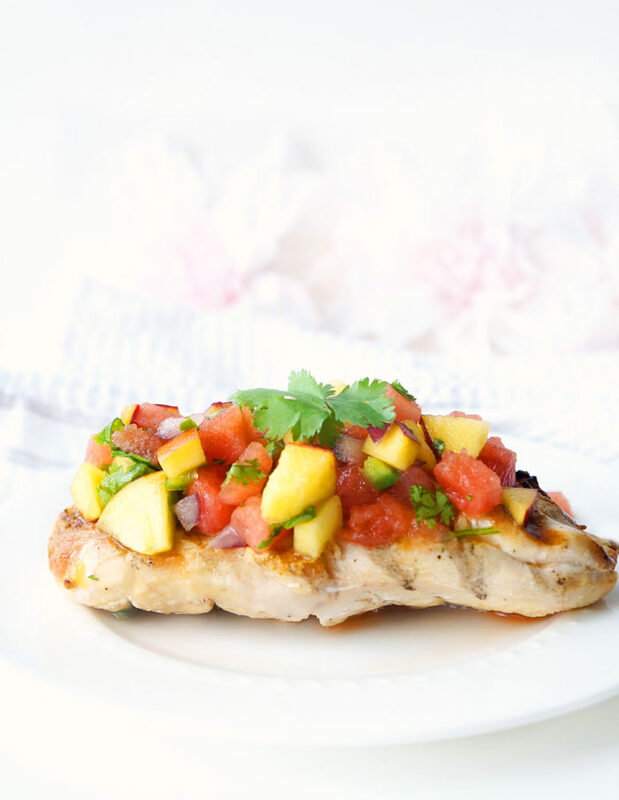 In our family, our go-to juicy spread has always been this pineapple mango salsa, but we decided it was time to switch it up a bit. 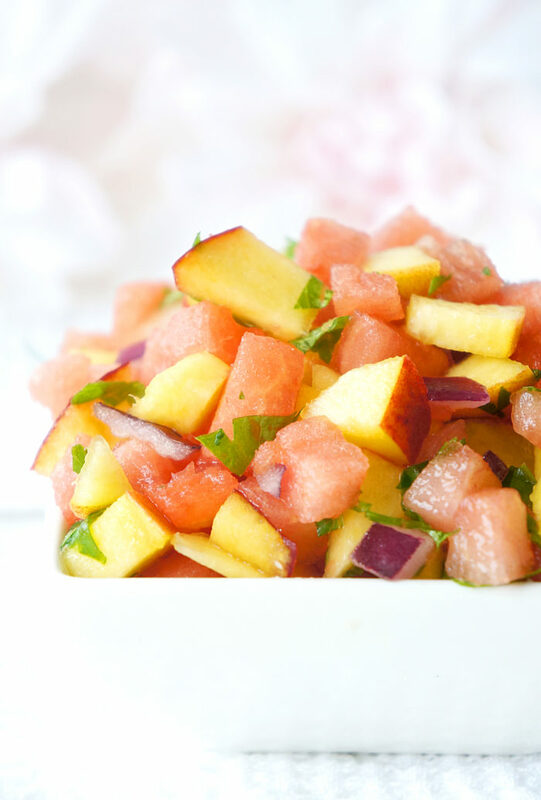 A few weeks ago, I was experimenting with this watermelon and peach salsa recipe and it was such an amazing combo. Just thinking about it makes me want to down a bowl of this salsa right now. Doesn’t it just look so juicy?? I’m such a huge fan of salsas because you can pair them with SO many different foods. 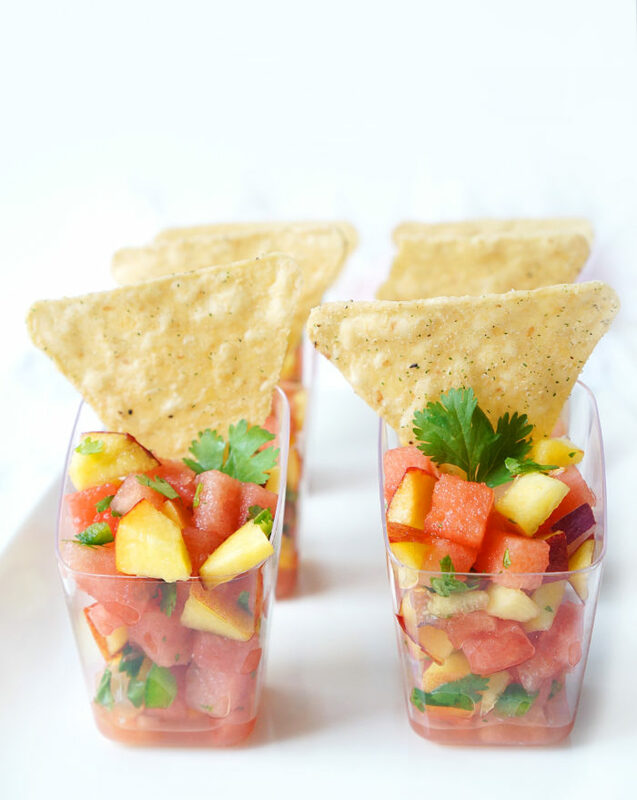 Looking for a summer appetizer? Use some crunchy tortilla chips to scoop up some of this juicy and colourful spread. 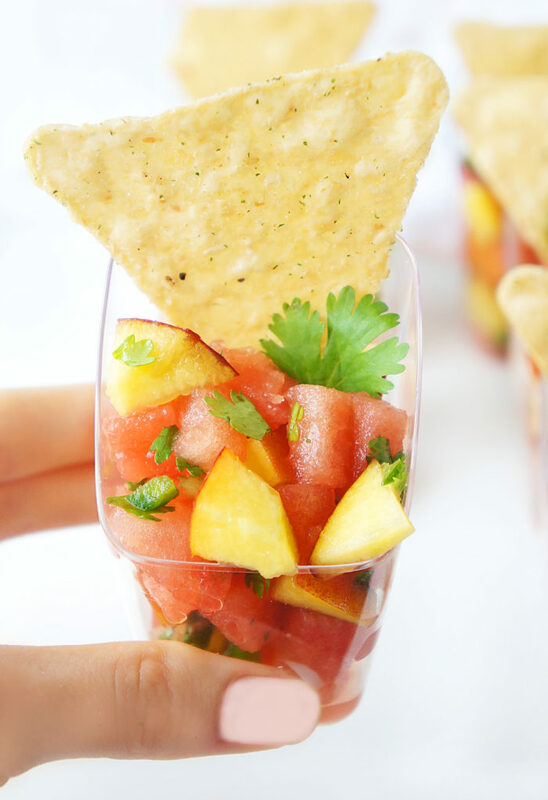 It looks so fancy and is perfectly portion-controlled in these cute little appetizer cups! When it comes to chips, I’m a fan of Que Pasa chips because they’re a good source of fibre and relatively low in sodium. Beanitos are another good choice because they’re basically made out of beans, so they’re also a source of the fibre and protein and they pair perfectly with this sweet and slightly spicy salsa. 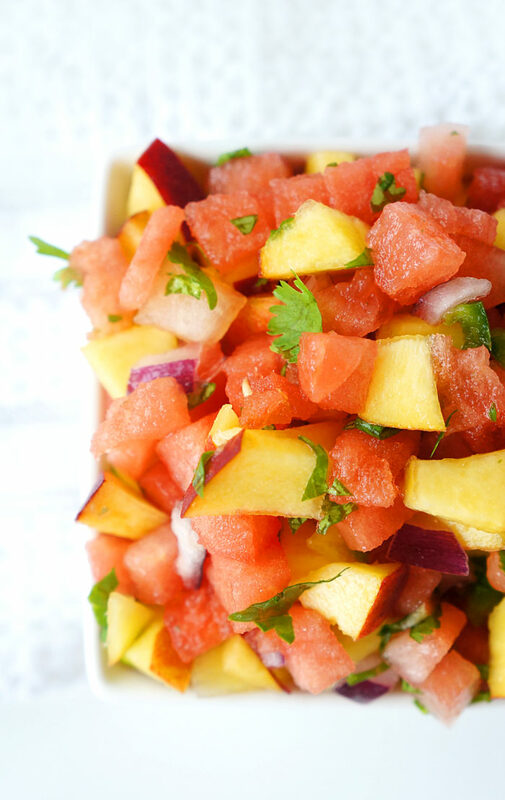 Or what about jazzing up some grilled chicken, fish or tacos with some of this fruity salsa! You’ll be amazed at how much flavour it adds! And it is SO refreshing, especially on a super hot day. Plus, did you know that watermelon is made up of 92% water? Perfect for quenching that thirst and staying hydrated, especially if you’re looking for alternative ways to increase your fluid intake beyond just plain old water. It’s also a good source of lycopene which is an antioxidant that can help protect against the sun’s powerful UV rays….which also means less sunburn and more beautiful skin for the long-term. Beauty and hydration all while eating some juicy and delicious melon? The peaches also compliment the flavour of the watermelon, add a dose of vitamin A & C and incorporate such a pretty colour contrast. I do have to warn you that this salsa does have a bit of a spicy kick to it from the jalapeño pepper, but it’s definitely not overwhelming. 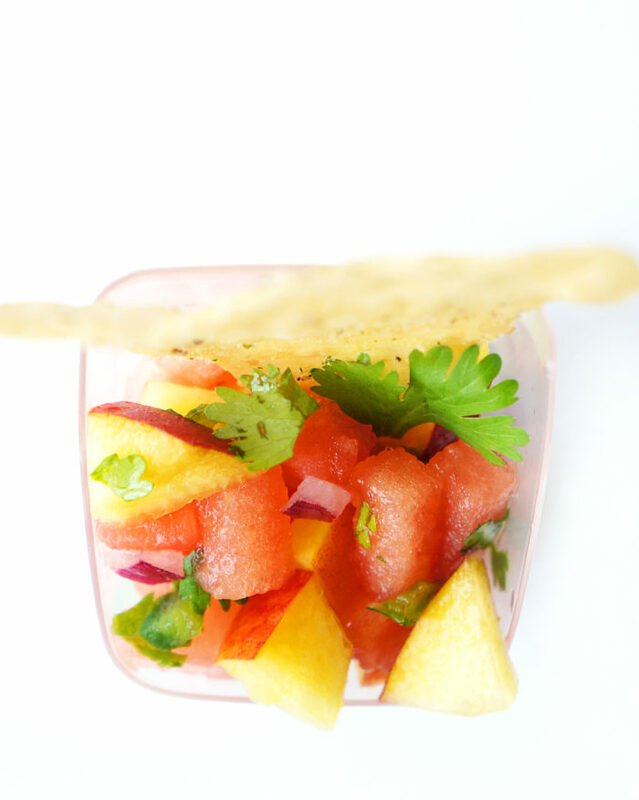 It’s actually quite delicious with all of the other flavours happening in this fruity salsa. For best results, I recommend letting the salsa sit for about half an hour before serving to let all the flavours intensify. You’ll notice it gets quite juicy, so you probably want to consume it within a day or so of preparing for best results. That being said, I ate it the next day after preparing it and it was still delicious! 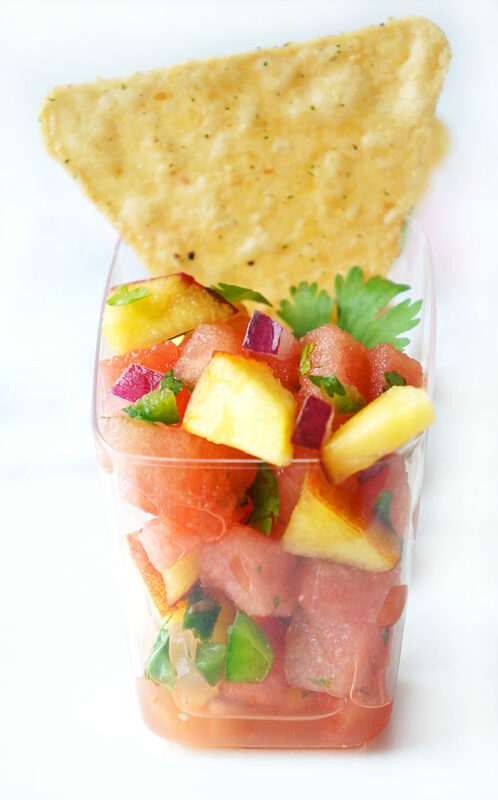 You definitely can’t go wrong with this mouthwatering salsa! What’s your favourite type of salsa? Combine all ingredients in a medium-sized bowl and let it sit in the fridge for approximately 30 minutes to allow the flavours to combine. Serve with tortilla chips, grilled chicken or fish.